The new Nissan Kicks has been launched recently and the car has been priced quite aggressively. Now, Nissan has released a lot of accessories for the compact SUV which can be opted by the customers at the time of purchase. Called the wall of personalization by the company, there are a ton of interior and exterior accessory options available for the SUV. Nissan is relying heavily on the Kicks to get a good piece of market share and therefore is hitting hard on all fronts. Down below is the TVC which shows a lot of customization options available with the compact SUV. Talking about the exterior customization option first, the company is offering roof and side graphics which make the car look more lively. There are two options to choose from and both get orange and black colour theme. Then there are a ton of chrome additions which can be made to your car in order to make it look good and blingy. They include stylish side steps, front radiator grille bars, roof rails, tail light borders, side scoop L-covers, and stylish machined alloy wheels among others. This translates into getting your car done according to your taste right at the dealership itself. 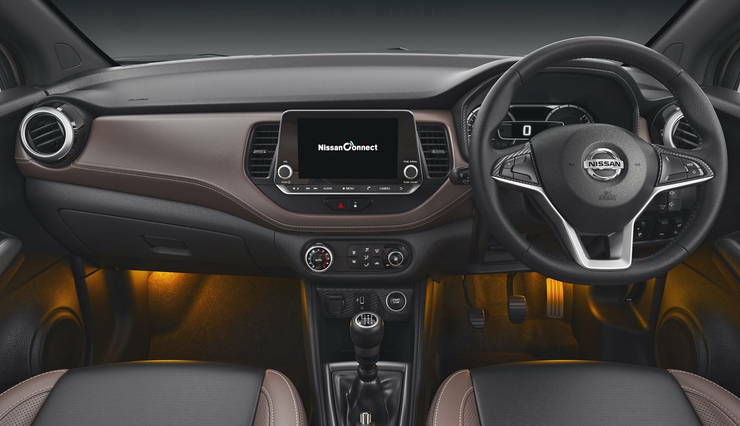 There are many interior customization options available too, which range from seat covers to ambient lightening. To be precise, the options include pillows, custom neck support cushions, seat belt covers, curtains, stylish and sporty steering wheel covers, custom mats, ambient lightening along with a host of seat covers to choose from. While opting for all of them would mean that the final price of your car would shoot up drastically, you can choose for the options that suit you the best. The Nissan Kicks is powered by a 1.5 litre H4K petrol engine that churns out 105 Bhp of power at 5,600 rpm along with 142 Nm of torque at 4,000 rpm. The diesel engine, on the other hand, is a 1.5 liter-4 cylinder K9K dCi unit which produces 109 Bhp of power at 3,850 rpm along with 240 Nm of torque at 1,750 rpm. A 5 speed manual gearbox will be standard with petrol engine, and will drive the front wheels. The diesel, on the other hand, gets a six speed manual. The base variant of the Kicks starts at Rs. 9.55 lakhs while the top of the line variant comes at Rs. 14.65 lakhs. The prices are in the same league as the Hyundai Creta but the Kicks offers better features and is more spacious too. Currently, the Creta is the besst selling compact SUV in India and features regularly in the monthly top 10 selling cars list. Nissan has aimed the Kicks squarely towards the Hyundai offering and it remains to be seen whether it will be successful in gathering good sales or not.